Spacious dance floor with thundering music played by the Disco jockey, covered with mist of water which is created by the rain pouring on your wish. Let your hair down while tapping to the beats of the DJ, under sprinkling showers, the time and the moment are all yours, the privacy is an added impetus. We, at DJ Rajan, have the right technology, equipment and devices for Rain Dance Parties. We have powerful speakers, waterproof equipment, etc. specially for rain dance parties. Along with microphones and headphones, our multiple record devices, samplers, drum machines, effect processors and computerized performance systems help our DJs enhance the experience. only on Friday Saturday and sunday. We offer our clients an exclusive range of Rain Dance. 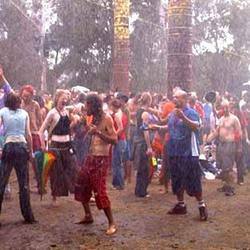 We, at DJ Apurva, have the right technology, equipment and devices for Rain Dance Parties. We have powerful speakers, waterproof equipment, etc. specially for rain dance parties. Along with microphones and headphones, our multiple record devices, samplers, drum machines, effect processors and computerized performance systems help our DJs enhance the experience. Be it rain or shine, nothing revives you faster than Rain Dance. Perfect your moves while we belt out the latest numbers. Splendor Country Club & Resort Pvt. Ltd.
2 Member band with musical instrument. Singing bollywood hit songs. - A rain dance is a ceremonial dance. It is performed by people who believe it will cause rain and keep their harvest safe. Dance, dance and just dance in the rain. You will feel the paradise on the earth. The awesome fun of dancing under the rain dancing floor can be experienced.